This entry was posted in Events, Museum and tagged exhibition, Jule Collins Smith Museum of Fine Art on January 14, 2013 by Wire Eagle. AUBURN UNIVERSITY – Auburn University will be the first stop in the United States for the exhibition, “Bauhaus twenty-21: An Ongoing Legacy – Photographs by Gordon Watkinson.” The exhibition, which has toured internationally since 2009, will be on display Jan. 25 through May 4 at the Jule Collins Smith Museum of Fine Art at Auburn University. Watkinson will open the exhibition Jan. 24 at 6 p.m. with a lecture and reception. “Bauhaus twenty-21” features photographs by Gordon Watkinson depicting examples of Bauhaus architecture along with building projects by up-and-coming as well as internationally renowned contemporary architects. Watkinson is a New York-based fine arts and commercial photographer who has worked for a broad range of clients from the fields of advertising, architecture, design and fashion. This entry was posted in Community, Events, Museum and tagged Advancing American Art, auburn university, exhibition, Jule Collins Smith Museum of Fine Art on August 31, 2012 by Wire Eagle. 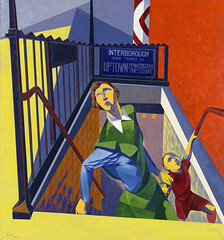 AUBURN UNIVERSITY – A collection of modernist American art was assembled in 1946 by the U.S. State Department and launched as a traveling exhibition, “Advancing American Art,” to show the world America’s artistic coming of age. Controversy arose, the world tour was short-lived and the collection was brought back to the United States and dismantled. This entry was posted in Museum and tagged art, exhibition, haitian, Museum on August 18, 2011 by Wire Eagle. 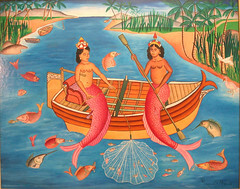 AUBURN – The Jule Collins Smith Museum of Fine Art at Auburn University will open an exhibition of Haitian art, “Lespri Endonptabl: Selected Works from the Winslow Anderson Collection of Haitian Art at the Huntington Museum of Art,” that will be on display from Aug. 20 through Oct. 29 in the Noel and Kathryn Dickinson Wadsworth Gallery and the Chi Omega–Hargis Gallery. “Lespri endonptabl,” Haitian Creole for ‘the indomitable spirit,’ is an exhibition of 32 objects produced in Haiti between 1945 and 1990 depicting themes of everyday life, landscape, flora, fauna, agriculture, folklore and Voodoo. This entry was posted in Events, Museum and tagged auburn university, exhibition, Museum, painting on January 12, 2009 by Wire Eagle. AUBURN – In conjunction with an exhibition of his works on display at Auburn University’s Jule Collins Smith Museum, noted painter, printmaker and illustrator Rafal Olbinski will be at the museum Thursday, Jan. 15, at 5 p.m. to talk about his work. The exhibition, “New Dreams of Old Values,” will be at the museum through Feb. 28. This event is part of the museum’s Third Thursday Free Nights and is open to the public. “New Dreams of Old Values” is a collection of recent paintings by the artist that build on a series of his works commissioned by the German periodical “Der Stern” to address issues of ethics and morality in the modern world. The works on display at the Jule Collins Smith Museum feature the artist’s recent musings on the subject, redeveloped as finished easel paintings. The exhibition is augmented by selected study drawings and a collection of Olbinski’s printed posters. This entry was posted in Campus Announcement, Events and tagged arts, exhibition on October 22, 2008 by Wire Eagle. AUBURN – Alabama artists will be featured in the juried exhibition, “Drawing on Alabama 2009, ” sponsored by the Department of Art in the College of Liberal Arts at Auburn University. The competitive exhibition will be juried by Maura Lynch, curatorial assistant, Department of Drawings, Museum of Modern Art, New York. This entry was posted in Events, Museum and tagged exhibition, Museum, sharecropper, walker evans on June 10, 2008 by Wire Eagle. Walker Evans (1903-1975), Crossroads Store. Sprott, Alabama, 1936, Farm Security Administration - Office of War Information Photograph Collection Library of Congress Prints and Photographs Division, Washington D.C.
AUBURN – “American Classics: Selected Photographs of Alabama by Walker Evans” will be on display at Auburn University’s Jule Collins Smith Museum of Fine Art from June 13 through Aug. 23. The exhibition will feature a selection of images made in 1936, when the editors of Fortune magazine sent writer James Agee and photographer Walker Evans, on assignment to document the southern sharecropping economic system.